THIS IS A SOLID SHAMPOO BAR CREATED WITH BABASSU OIL AS WELL AS COCOA, SHEA BUTTER AND SOAPNUT. IT IS COMPLETELY PALM OIL FREE AND VEGAN. BABASSU OIL IS THE PERFECT OIL FOR TREATING DAMAGED AND BRITTLE HAIR. YOUR HAIR WILL BE GLOSSY AND SHINY. IT HELPS TO RESTORE THE LOST ELASTICITY IN YOUR HAIR AND MAKES IT APPEAR VOLUMINOUS AND FULL. THE ADDED OILS CONTAIN ACIDS THAT CAN WORK MIRACLES WITH DRY SCALP. 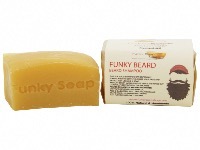 THIS IS A SOLID SHAMPOO BAR ESPECIALLY FORMULATE TO GENTLY CLEANSE YOUR FACE AND BEARD. 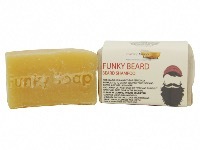 IT CONTAINS MOISTURISING HEMP OIL AND SHEA BUTTER, LEAVING YOUR SKIN AND BEARD FEELING FRESH, CLEANSED AND HAPPY! THIS IS A SOLID SHAMPOO BAR CONTAINING SEA KELP AND RHASSOUL CLAY, WHICH HAS BEEN INFUSED IN OLIVE OIL 2 WEEKS PRIOR TO THE MAKING. SEA KELP IS GREAT FOR STRENGTHENING AND THICKENING YOUR HAIR AND PROMOTE HAIR GROWTH. RHASSOUL CLAY IS FULL OF MINERALS AND WILL HELP COMBAT OILY HAIR WITHOUT STRIPPING THE NATURAL OILS WHILE INCREASING THE HAIRS ELASTICITY AS WELL AS UNBLOCKING YOUR SCALP'S PORES ELIMINATING SCALP CONDITIONS LIKE DANDRUFF. THIS IS A SOLID SHAMPOO BAR CONTAINING TEA TREE AND NEEM OIL TO HELP WITH OILY HAIR / ITCHY SCALP AND SCALP CONDITIONS SUCH AS DANDRUFF. TEA TREE AND NEEM OIL HAVE LONG BEEN USED TO TREAT SCALP CONDITIONS DUE TO THEIR ANTISEPTIC AND SOOTHING PROPERTIES. TEA TREE IS A NATURAL HAIR CONDITIONER CONTAINING ENZYMES TO PROMOTE HAIR GROWTH AND ALSO HAS ANTI-INFLAMMATORY PROPERTIES THAT HELPS TO REGENERATE HAIR AND SCALP.